Standard electrical NEMA 12 construction, 230 volt 3 phase, with NEMA 4X immersion heaters; * designates 480 volt, 3 phase electric in table at above right. 110 volt control transformer on all machines. Digital indicating temperature controller. Optional gas, steam or explosion resistant heating available. Standard construction of mild steel, 10 gauge inner tank double seam welded inside and out, 3 inches of insulation, outer shell of 14 gauge mild steel finished in Polane® polyurethane enamel. Full length stainless steel piano hinge. Optional stainless steel construction 10 gauge type 304 stainless steel inner tank with all wetted parts including rack, beams, lid and tower of type 304 stainless steel. Stainless construction designated by -SS at end of model number. Outer shell of 14 gauge mild steel finished in Polane® polyurethane enamel. Exhaust fan construction is spark resistant. Optional recirculating hot air blowoff feature available. Externally mounted stationary load bearings not immersed in cleaning solution. Heavy duty X braced beam with replaceable stainless steel wear strips. Every part subject to wear can be removed and replaced in the field without the need for factory repair. PATENTED DESIGN with externally mounted bearings eliminates the problem of immersing bearings in cleaning solution. HIGH VOLUME FILTRATION SYSTEM with 3 HP pump and stainless steel construction provides sweeping action to flush solids into pump and through stainless steel bag style filter. Hopper bottom design standard for ease of cleanout and maintenance. Adjustable returns to sweep settling solids and flush top surface towards scum gutter to remove floating wastes. UNIQUE DRYER DESIGN provides true gas fired hot air drying, with 3,000 CFM recirculating fan and up to 500,000 BTU of heat to quickly dry parts, not just an air blower. STANDARD AND CUSTOM DESIGNS to meet any requirements; up to 6,000 pound loads, virtually any dimension or layout requirements. Connecting conveyors, either manual or powered, in mild steel or stainless steel, with dip pans available. Designed to fit YOUR production needs. HEAVY DUTY CONSTRUCTION features 10 gauge minimum inner tank construction with 16 gauge minimum outer shell with three inches of insulation. GAS, ELECTRIC OR STEAM HEAT AVAILABLE 400,000 BTU gas heat with immersion fire tube design obtains over 80% efficiency. NEMA 12 electrical panel with digital temperature controls and NEMA 4X immersion heaters or double embossed stainless steel steam coils for high efficiency heating. 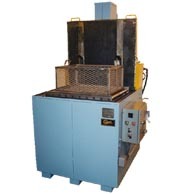 OIL SEPARATION SYSTEM available to extend cleaning system life. Separate phase separation tank with oil belt style skimmer continuously removes floating oils and returns clean solution. SEPARATE STAGES allow for the addition of more process steps at a later date if desired or if needs change.